For his first attempt, Billy swam to the ship “covered in river scum, hair hanging down his forehead like oily kelp.” To his astonishment, Billy found that he was one of three stowaways! On his second attempt, Billy tried for a cargo ship, believing it would be “less guarded than the flagship had been.” He was quickly discovered hiding in a paint locker. Amazingly, Billy soon became famous, and newspapers shouted, “STOWAWAY FOUND IN HOLD!” On his return from Antarctica, Billy gave a talk on New York’s WOR Radio, was feted at banquets, was given a silver medal, and was a guest at the White House! Eventually, the fame wore off, and Billy had to get a job. He became a ship captain in the Merchant Marines. After Pearl Harbor, Billy served on Liberty ships, and became a captain at age 32. He continued working for many years in the Merchant Marines, as well as the US Military Sealift Command. At the very end of the book, the author recounts her research efforts. Trying to find Billy’s family, she called many families with the same last name. Finally, she reached an elderly woman in Maine. It turned out to be Billy’s widow: “The frail voice said, ‘That boy was my husband.’” Billy had died years earlier, but his widow was eager to share his story. 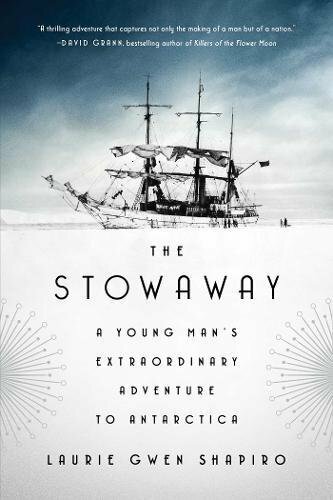 All in all, I found THE STOWAWAY to be a fascinating, fun read. History buffs will especially like the interesting tidbits about Byrd’s expeditions. I thought the first stowaway attempt was the most interesting.